When asked about Atari Portfolio, a "retrocomputing regular Joe" would say about "the world's first palmtop" (not true, obviously) or John Connor breaking into an ATM. It seems, however, that Portfolio's popularity goes beyond these clichés; I can't rely on the survey I recently did (13 votes, shame on you! ), but the statistics of this blog don't leave any doubt - most of the visitors coming here are looking for something related to the Portfolio. 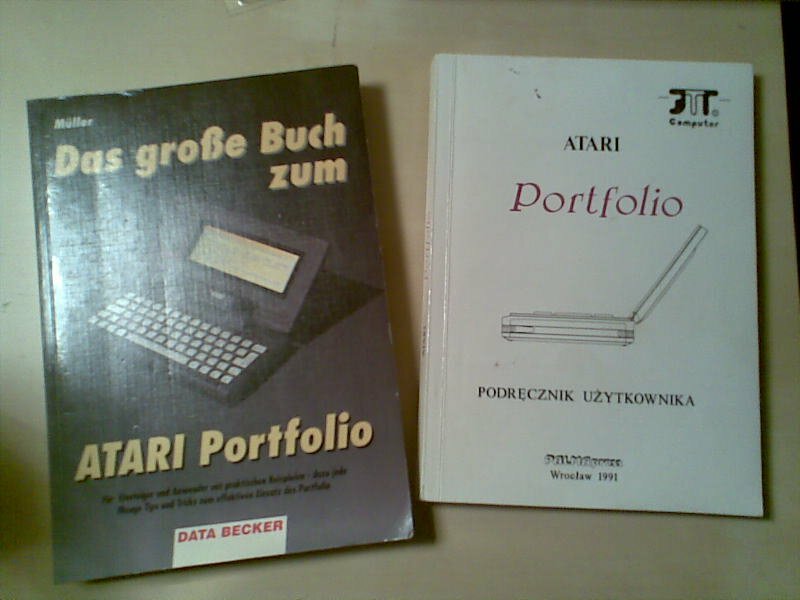 Thanks to its moderate price Atari Portfolio gained much more popularity than other palmtops of those times, especially in Europe. In fact, in countries like Poland or Czech Republic it was the only palmtop that could be easily afforded by "the masses" - and that explains the explosion of homebrew software and hardware made in this part of the world. Especially Czech achievements - from the fast graphic routine to sophisticated built-in CF reader - have made a big impact on the Portfolio and the community around it. I don't know, though, why Portfolio was so popular in Germany. Made it was because of its internal simplicity, so much corresponding to German "tinkering spirit". The not-so-long-ago-abandoned (or is it still alive?) PofoWiki features many hacks and tweaks - hardware- as well as software-wise, like extremely useful fancy batch scripts (!). Atari Portfolio had many flaws - bugged ROM, badly designed screen hinges, lack of essential accessories out of the box etc. - but it was and is extremely popular, comparing to its competitors of that time. I guess that it's like with ZX Spectrum: maybe technically it couldn't compete with other 8-bit home machines, sure it had its flaws, but it is now among the most popular vintage computers and it has probably the most thriving community of devoted fans, with the amount of newly created software and hardware far exceeding other 8-bits. 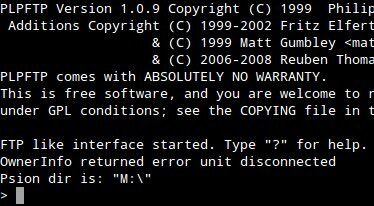 I remember that I promised to write something about connecting Psion palmtop (either Series 3 or Series 5) to a Linux-based PC without using CF card. Just a PC-Link cable. The great news is that many Linux distributions... already have everything we need. Yes. If you own Ubuntu or other debianoid, simply install plptools (sudo apt-get install plptools). The same for RedHat; I don't know about other distros. Now the bad part. Since Ubuntu 11.04 (?) the "core" feature of plptools, called plpfuse, has been disabled. I read that it was because there had been some problems with it. Generally, it was a daemon mounting Psion's filesystems as a normal drive. I tried it in Ubuntu 10.04, but it really didn't work well, so no. We'll do it the other way. 1. 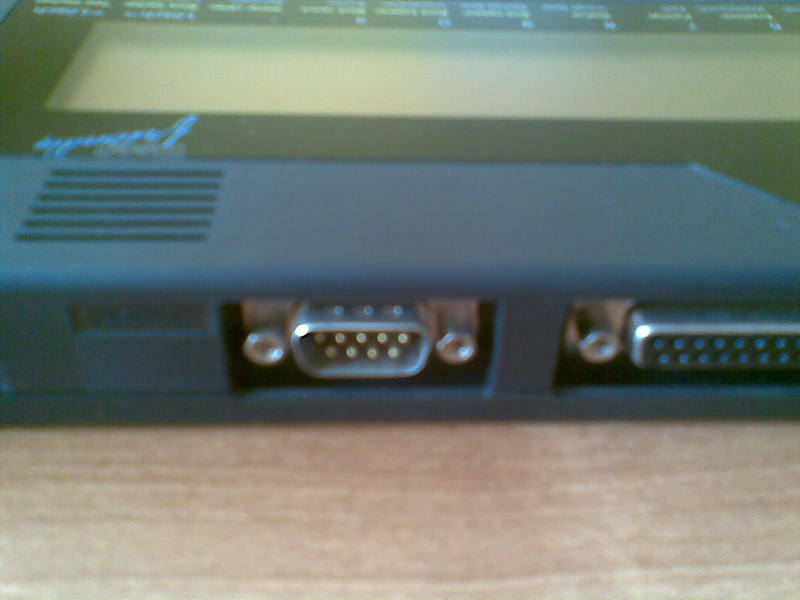 I connect the Psion with the PC using PC-Link cable. for I have the cable plugged in to the USB port using an adaptor. In case the above code doesn't work, execute dmesg | tail and try to find out what the name of the device should be. Also remember to check the baud rate entered (the -b parameter). If everything went alright, the daemon should start running without any message. Notice: file names on Psion's drives are case-insensitive. On the PC they are not. 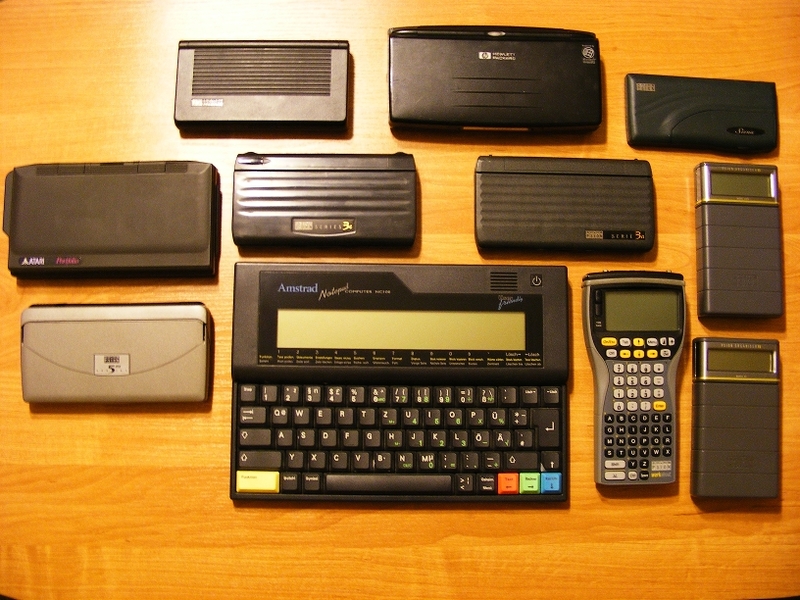 And that's basically all you need to send and receive files between Psion and a PC. For more commands type help while in plpftp. 5. After a successful session I quit plpftp (bye) and shut down ncpd using Ctrl-C.
mii3 sent a useful shell script to synchronize the Psion. I guess it's taken from this forum post, where you can also find the required usbpsion script. printf “33[32m%10s\n33[0m" "PC => Psion"
printf "33[32m%10s\n33[0m" "Psion => PC"
printf “33[32m%10s\n33[0m" "Backup: Psion => Psion (D:)"
What is your favourite vintage palmtop? Just for fun, statistics and my curiosity 🙂 You may select up to three options. If your favourite is not on the list, please select "other" and write its name in a comment. Hey, I just found something. 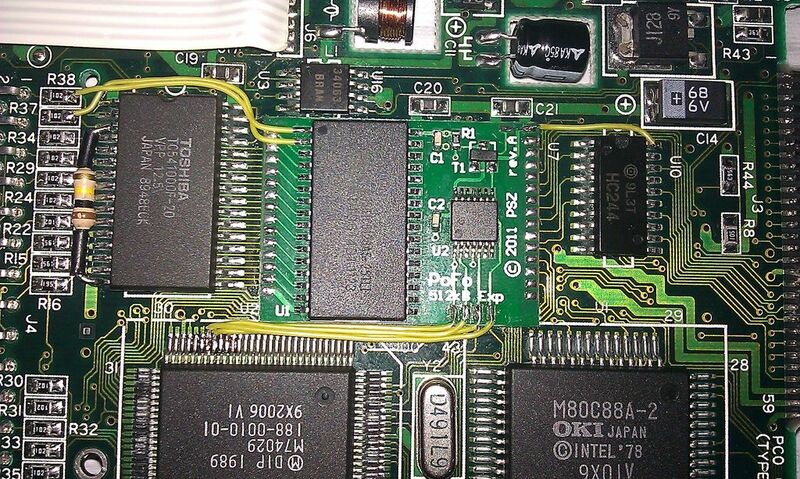 It seems that someone solved the "chicken or egg" problem with Portfolio's serial interface: the computer has no serial communications software built in, so it's impossible to send any from the PC and, unless you have a parallel interface, you're virtually unable to use the serial port to transfer files. Digging through the files on atari-portfolio.co.uk I accidentally spotted this. 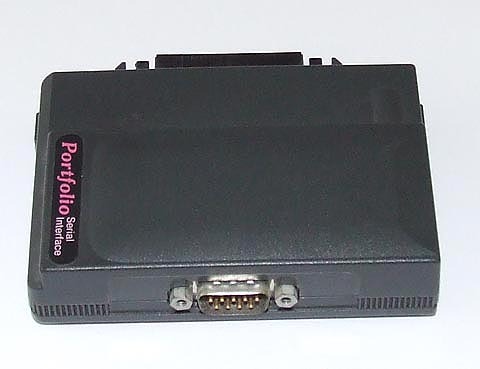 It's a tiny program that sends Xterm2 to the Portfolio over the serial port. I haven't tested it (for I don't have a serial interface), but I bet it would work, with a simple yet brilliant idea behind it. You can easily synchronize the Palm with a Linux PC. There are a few - ancient but fully functional - utilities available. J-Pilot provides something like the original Palm Desktop interface, a simple PIM capable of synchronizing all data with a Palm and installing applications on it. Gnome-pilot is much more integrated into Gnome. You get an applet where you can set up the connection and... that's all. There are several plugins supporting so called conduits: PIM (including mail) synchronization with Evolution, uploading apps from Nautilus, downloading Expense reports and so on. (You may need to associate gnome-install-file command with Palm files.) I guess that KPilot does the same (for KDE) but I wasn't able to check it. There is also PilotManager, which seems interesting since till 2010 it was still developed. When using a Palm, sometimes an emulator may come in handy (for example to test unknown applications before installing them on the palmtop). You may find several emulators, mainly based on an old Copilot. There is a version of POSE (Palm OS Emulator) for Ubuntu, but I couldn't get it to work, so I installed a Windows version. It works well. You need to download Palm's ROM image or transfer it from your device using a tool that comes with the emulator. This will be useful only to Polish users: There are a few ways to get Polish letters (like ą, ć, ł) working on a Palm - both on the screen and in handwriting. Interpilot seems to be the most sophisticated and versatile, with not only Polish, but also Russian, Greek, Czech, Turkish and other versions. I installed it in the emulator, but it horribly slowed down the machine, so I started to look for something else. Palm OS has a great feature called hacks - small tools that tune the system to better meet your needs, custom character set may be a good example. But... no, not yet 🙂 Finally I downloaded Bocian III - a small app that supports only Polish language (CP1250 charset and Graffiti). If you don't need fancy features like translated system messages, give it a try. The game is in Polish, but hopefully some day an English version will appear. However, you may want to write your own text game and that's why I chose Portfolio Basic (I wouldn't advise you to use it otherwise) - in my humble opinion the engine is simple enough for anyone with - nomen omen - basic programming skills to use it for creating their own game or even to modify it. 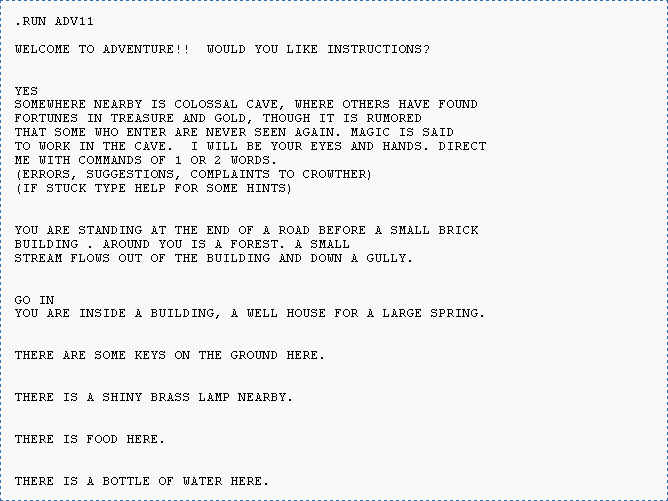 It comes with 48x8 text mode (with user-definable characters) and PGC support (actually built-in PBasic's feature). The only drawback is the annoying speed, making reading longer chapters boring. Download the game from the Download section. It's been a long time since I wrote here. SillyVenture 2k11 is over and I was there, but had no time to write even a short report. Today I promised myself to write a post, that has been waiting in a queue for long. RAM expansion. The must-have mod if you want to use something else than the built-in software on your Portfolio. Already in the 1989 128k was too little. With 4 kilobytes taken by display RAM, at least 8 KB used as ramdisk and some memory used by system (depending on FILES and BUFFERS settings in CONFIG.SYS), less than 100k was available for the program. With 40-kb ramdisk (absolute minimum when you wanted to upload some software) you were left with no more than 60 kilobytes. RAM expansions appeared soon after Portfolio, the first ones being large, uncomfortable interfaces mounted to the expansion bus. Early mods built in the Portfolio were two times the price of the computer. As years were passing by, more and more sophisticated solutions were emerging for affordable prices - both commercial and fan-made. In the 2000s, with the twilight of Atari Portfolio, RAM expansions have become extremely hard - if not impossible - to acquire. This makes the computer virtually useless for any applications but using the built-in software, especially for coding. 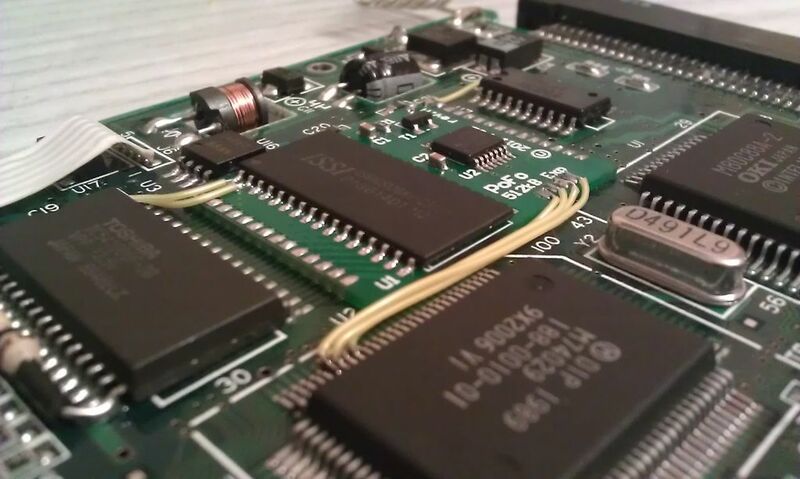 It was clear for Maestr0 - a talented constructor who decided to create a new 512 KB built-in RAM expansion for Atari Portfolio. Apart from expanding my Pofo's RAM, Maestr0 replaced the capacitors, making my computer run 10 minutes without batteries! Maestr0's construction includes a small PCB mounted on the Portfolio's mainboard. It's intended to be as cheap as possible and easy to assemble. When the author decides to release it, I'll inform you about pricing, shipping conditions and how to purchase.